Advertising your business with the use of flags and banners is extremely popular and is proven to build your visibility in the marketplace. Flags and advertising banners are perfect for attracting the attention of future customers as well as an exceptionally powerful method to increase sales. Some concerns are raised about whether flags and advertising banners actually work to increase sales as well as boost business customers; the answer is “yes they can!” This is done by immediately establishing a presence in any market or creating a unique display environment that is sure to grab attention. 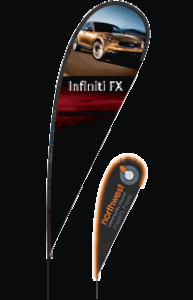 The flags and banners can be used individually or can be placed together to multiply the effect. Once the flags and/or advertising banners are placed in the environment for use, you can immediately see the authority they respect when displayed. Please also keep in mind that the message you are trying to get across can be just as important as the use of the flag and advertising banner. Fresh marketing slogans and catchy sayings will help turn the heads of impending clientele and will maintain a lasting impression in the potential customer. To incorporate flags and banners to your advertising campaign or marketing arsenal, you must incorporate your message with your overall goal you plan to achieve. Once you can set your message aim and establish who your potential customer’s might be; laying down the marketing message that will have the most impact becomes simple. The new designs of each flag we take deliver continuous visibility of your logo or company name to grab your customers' attention. Every pole scheme is comprised of a proprietary combined combination composite that is the strongest and lightest available in the market today. Patience is key when incorporating the use of flags and banners as the longer they are displayed for all to see, the greater the advertising presence you will achieve. Learn more about how these products can benefit your company by contacting a helpful sales rep, toll free, at 1-866-552-2683.